Heat the oil in a very large saucepan over medium-high heat. When hot, add onion and sauté until tender and medium brown to give the onion a lovely caramelized taste. Stir in garlic and cook for 1 minute longer. Add tomatoes and stir. Then stir in the prepared Gee Whiz Spread, nutritional yeast flakes, salt, pepper and cayenne (if using) and mix well. Simmer gently, stirring often, to warm through. Meanwhile, cook pasta according to package directions. 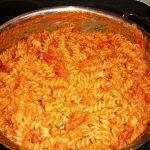 Stir hot pasta into simmering sauce and combine gently but thoroughly. 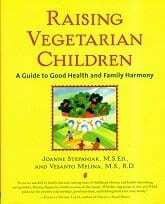 Copyright © Jo Stepaniak and Vesanto Melina, Raising Vegetarian Children.